13 Picture Books That You Won’t Dread Reading. Reading with kids is a combination of two of my favorite things: my kids and reading. And while I generally love to read almost anything, some books are just not worth being read more than once. I find this especially true with children’s books. 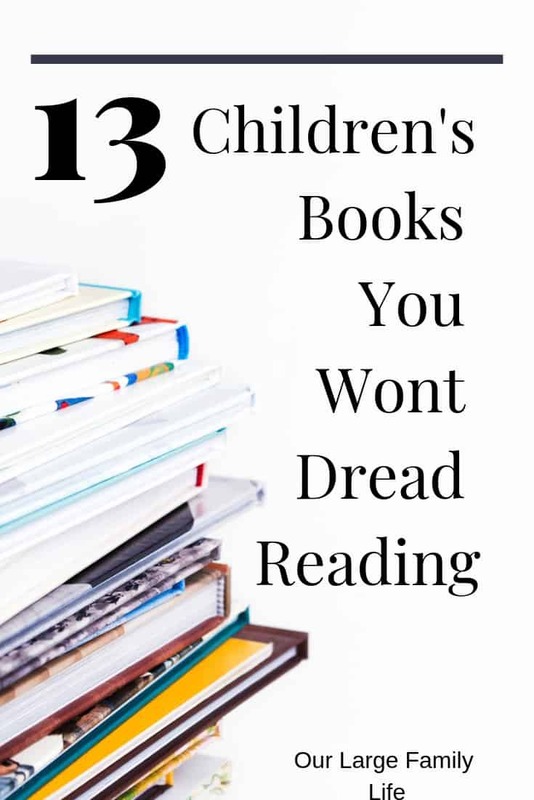 There are some I can’t stand, and it usually happens that my kids want me to read them over and over again. (I think there is some laundry I better go fold somewhere). I will read books to my kids even if I don’t enjoy them, because they ask. If I’m going to read it over and over, it’s got to be a good one. Most of the time the books I don’t enjoy come from the library where there are so many you never know what you’re going to get. The books below are books on our shelves. They are definitely worth owning. 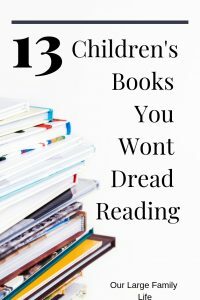 If you are looking for some great books to read that you will hopefully enjoy as much as your kids, here are some of my absolute favorite children’s books. I absolutely adore this book. My kids received it for Christmas one year and I’ve loved it ever since. Written by Robert McCloskey it follows Sal and her mother as they pick blueberries for winter. If you loved Blueberries for Sal, then you must read on as Sal grow up and loses her first tooth. I didn’t even know about this book until I found it one year at a homeschool conference and knew before I read it that we had to own it. This book is seriously so fun and I love strawberries so it’s a great combination! If you haven’t guessed by now, I am a huge Robert McClosky fan. If you’ve never heard of him or his books, run to the library right now to check them out. He is an amazing illustrator as well as a writer and his books are gems. In Make Way for Ducklings, you get to follow Mr. and Mrs. Mallard as they find a place to live in Boston. This book is so sweet. Written by Barabra Cooney, who has also become one of my favorite writers, we follow the journey of Ms. Rumphis from young school girl to young adult to old women as she travels the world and seeks to make it more beautiful than she found it. Caps For Sale is a cute little book about a peddler trying to sell his caps. He runs into some trouble with some naughty monkeys that always makes children laugh. This is a fun one especially if your kids love farms and animals (which I think most do!). I have this one memorized to the point where I can say the words and flip the pages without ever having to look at it. That’s how you know it’s well-loved 🙂 It’s by Margret Wise Brown who has authored a number of great children’s books. This book is so sweet. I have no idea how closely it follows the movie that came out a couple of years ago. I know my kids saw it and like it. This is a great book about just doing your own thing. Really who doesn’t love finding out what George will get into next? There are so many in the series that you even if you don’t like one there are more to choose. This one is so cute. A little bird searches for his mom and finds a lot of things that are not his mother. It’s easy to read and isn’t very long which makes it easy to read when you only have a couple of minutes. Like, Are You My Mother, this story is a quick read. If you are more creative than I am you could even sing the little song she sings. I’m lame so I don’t, but no one seems to notice. So I was wrong. We don’t own this book or the one below but they get checked out so frequently that I thought they were ours. In this book, a little boy finds some almost dying plants in a city with nothing green and decides to become a gardener. A very fun book that shows how one person’s actions can have a ripple effect. I love the imagination of Harold and his purple crayon. Harold goes off on adventures making it up as he goes along, and luckily he always has his purple crayon to get him out of trouble. Hopefully, you will enjoy reading these books with your kids as much as I have. I’d love to know what your favorite pictures books are below!